Twin Cities Academy is tuition free public charter school Middle and High School where parents exercise school choice in sending their children here. There are many reasons families find us, including our reputation, our education model, and our outstanding results. It is not a typical school. We differ in our expectations of our students, and accountability is one of our core values. We also foster a rigorous academic environment. By rigor, we mean that we provide a disciplined and hard working environment. 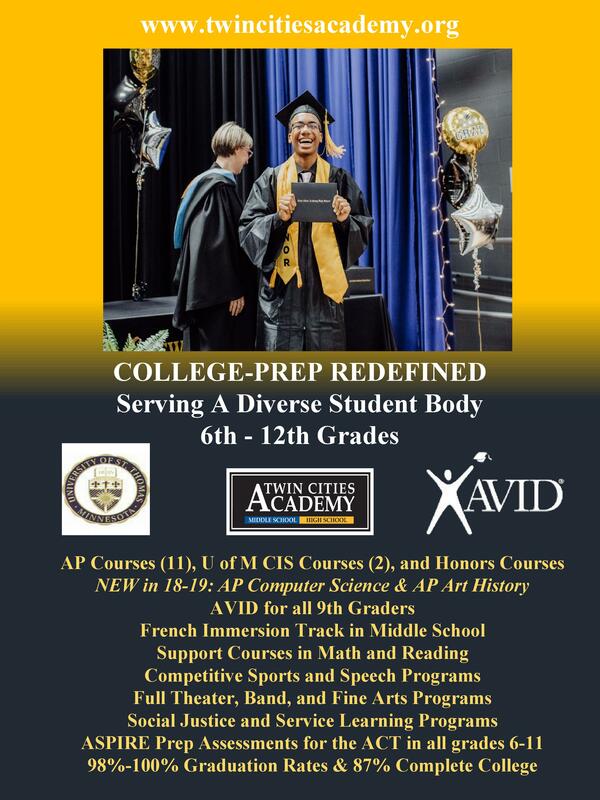 Informational Sessions are held for families interested in attending Twin Cities Academy to gather more information. They are held on Thursday evenings and Saturday mornings. Please plan on at least an hour per session. We offer Student Shadow Days throughout the year for prospective students to come and “shadow” a student who is enrolled at Twin Cities Academy to get a feel for what a typical day at our school is like. We have a Parent “Drop-In” Visit Day scheduled for January for prospective parents to come and “drop in” to classes and see what we’re all about. We also encourage prospective families to come for a tour – get personalized attention as you take a look at our space and get your questions answered. For a list of all of our recruitment events for the upcoming 2019-2020 school year, please click HERE. The 2019-2020 online application is available HERE.